Staveley Miners Welfare Football Club - 'The Trojans' - pride themselves on being a Community Club and are heavily involved with local community events and support in Staveley and around Chesterfield. 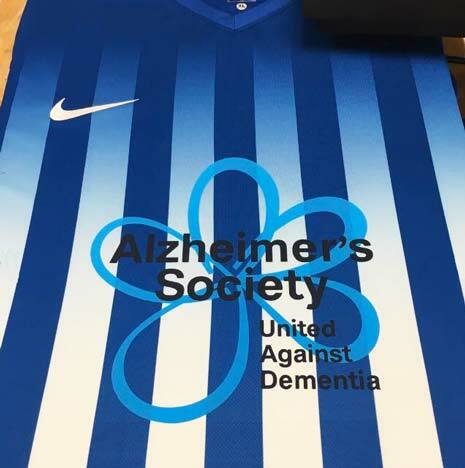 For every one of their new shirts sold (emblazoned with the Alzheimers Society Logo rather than a club sponsor - see above), £10 goes to the charity (the shirts cost £20 each), plus a further £500 Shirt Sponsorship equals a massive £700 total raised thus far this season. Following this latest of many club and community driven fundraising efforts, the club is renaming the stadium located on Inkersall Road, the 'Staveley Community Stadium'. Chairman Terry Damms said: "Given our club's drive and commitment to the local people and area, we feel it right and proper to name our ground the 'Staveley Community Stadium'. "We are now looking for a new sponsor to assist this initiative with an offer of Sponsorship for the remaining 8 months of this season. "The chosen Sponsor's money will go straight back into the ground's facilities improvement fund, going towards building a new club shop and a first floor seated area above the new club shop adjacent to the 'Tower Bar', further enhancing the stadiums draw, both for our army of loyal support and for bringing in more new fans, enabling us to raise further funds for local community and charity by staging new events and sponsorship programmes. "If you, your business or someone you know would be interested in raising their profile by supporting this exciting new stadium development, please get in touch (in the first instance) by contacting the Club Secretary, Ele Reaney via email on staveleyed@hotmail.com or myself at teldamms@aol.com or via the Staveley MWFC website at www.staveleymwfc.co.uk/contact/." Reward for victory over Pinxton in round 1 was a trip over the Pennines to face North West Counties Division One (equivalent to the division below Staveley) outfit, Charnock Richard. 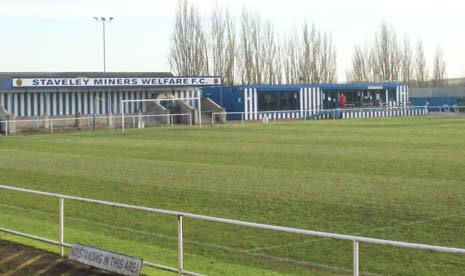 Birch Park was the venue for Staveley Miners Welfares latest trip away from Inkersall Road, where Bottesford Town were the opponents. 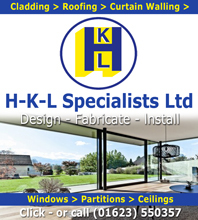 Staveley MWFC returned home after two games on the road and were looking to add to the three points they brought back from Harrogate the week before, in this game against Athersley Recreation. For the 2nd season in succession, Staveley MWFC's opponents, Pickering town, arrived late meaning kick off was delayed by half an hour, but at least they didn't need to use Staveley's away kit this time around! FIVE STAR STAVELEY FIRE FIVE PAST LIVERSEDGE.